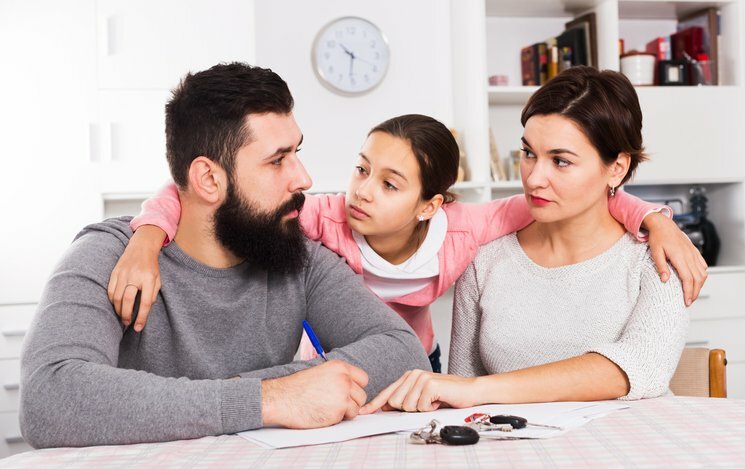 Are you curious about how to tell your kids you’re getting a divorce? While telling your kids about getting a divorce may be difficult, it is essential to maintain civility with your spouse. Your children, now more than ever, need to know their parents love them. If you plan to tell your kids you’re getting a divorce, there are several considerations you must take into account. For one, consider their age, maturity, and intelligence level. Of course, you must give them time to process the information and allow them to ask questions while remaining supportive. Taking the following approaches into account can help to keep your divorce as smooth and as easy on your children as possible. If you are ready to tell your kids you’re getting a divorce, you and your spouse must sit the entire family down at one time and express your love for them. Relay, that what you are about to tell them is not their fault and nothing they did is the cause of your divorce. Agree ahead of time with your spouse how you will answer specific questions and reiterate the idea that you and your spouse will always be their parents. Using “we” statements can give them the idea that you and your spouse made this decision together and that it will be in everyone’s best interest. Most children have the desire to see their parents remain together. Having to tell your kids you’re getting a divorce can cause confusion, sadness, anger, and resentment in them. Explain that you will maintain a civil and loving environment for them in both homes. You might not be on the best of terms with your partner if you chose to tell your kids you’re getting a divorce. However, it is of the utmost importance that you remain civil to your spouse when speaking in front of the children. When breaking the news, do not place blame or argue about whose fault it is. In the same regard, never speak ill of your ex in the presence of your children. Your children love both of you and speaking ill of the other tests your child’s allegiance. Always maintain a manner of respect and civility when interacting with one another to set a good example for your children. Your divorce will be something they remember for the rest of their lives, so show them how to handle difficult situations by managing your words, actions, and emotions. If you can provide more details with regards to how this will affect their living situation, make relaying those details a part of your plan. Kids often first wonder how this decision will immediately impact them. Having as much information available to them can help in easing their minds. Keep in mind, canceling an activity you have already planned with them can make them upset and cause them to associate your divorce with a punishment. Try to keep your plans intact so as not make them think they are in trouble. You cannot tell your kids you’re getting a divorce and expect them to have no questions. The initial conversation should be an icebreaker of sorts. Decide on how you will answer specific questions beforehand. Be as open and upfront as you can be without divulging information they need not know. Express to your children that you may not have all the answers at the moment, but let them know you will answer those questions as you go through the process. Allow them to ask you questions as the time passes. Give them space and time to process what it all means, and avoid showing frustration if the questions they ask make you uncomfortable. Be patient with yourself and your children and do your best. In essence, children want to know they are loved and that they are safe. Going through a divorce with children can be difficult for everyone involved. However, having a plan, being open, and remaining civil with your ex can provide an excellent example to your children and minimize the pain associated with divorce.